Happy Friday! Did anyone shop the Nordstrom Anniversary Sale yesterday? This is the first year that I was able to shop the sale in store, and on opening day. As much as I love sitting on my couch and ordering online, it was fun to be able to try everything on. There were a few things from my top picks list that weren't available at my local Nordstrom, so I'll probably be doing another online order soon! I tried a bunch (okay probably half of the store) on, but I'm sharing the items that were my personal favorites, and practical for my everyday #momlife. The outfit above was by far my favorite, and I know that I will be wearing these items on repeat this fall and winter. This BP. Cardigan was a best seller last year, and I have no doubt that it will be a top seller again this year. It's the perfect sweater to throw on over everything from jeans to dresses, and it come s in 6 colors. You can't beat the (sale) price at $31.90. This lace trim camisole was another favorite that I took home. When I saw this camisole online, I wasn't sure if I was going to like it, as it looked a little cheap, but when I tried it on, I fell in love. Not only does it drape perfectly, but it makes such a great layering piece. It does come in green and ivory, and I'm thinking that I need all three colors. Also, these jeans are amazing! They're by Articles of Society and I love distressing and raw hem. I can't get over the fact that they're on sale for under $42! Size tip: size down. I wore my usual size 26, but had some room, so if they stretched out, I would have wanted the 25. It's funny because these BP. Mules are probably my favorite purchase from the sale, yet I had no intention buying them, or even trying them on. When I was in the shoe department, I walked by them several times and didn't give them a second thought. It was on my third loop around the shoe department (hey, I wanted to make sure that I didn't miss a shoe!) that something made me grab them, and the rest is history. They are SO comfortable, and I know I'll be pairing them with everything this fall. They do run a little small, so I sized up a half size. They also come in blush and silver, and are on sale for $52.90. This Leith cardigan was the other sweater that I fell in love with. Not only is it beyond cozy, but I love the way it drapes. I actually didn't take it home with me, since I was already getting the BP. 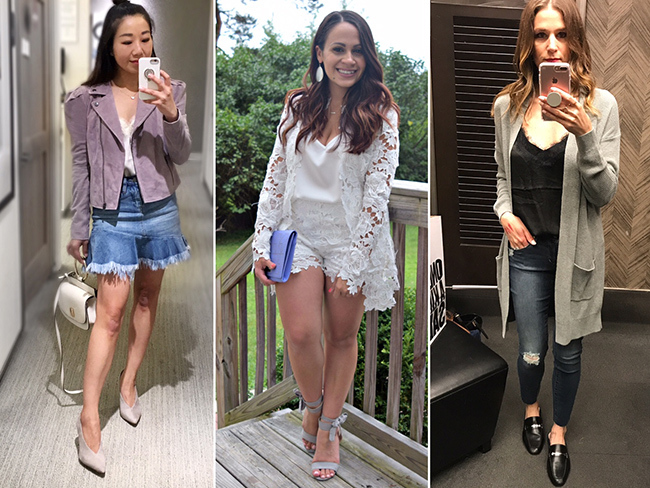 Cardigan, and had total regrets, so I ended up ordering it as I was writing this post! I feel like it looks and feels more expensive than it actually is, and know it will be a fall staple. It also comes in burgundy, grey, and blush, and I'm DYING for the blush color. They didn't have in my local store, and the blush is sold out online (in my size) so I will be stocking the sale to see if it comes back in stock. 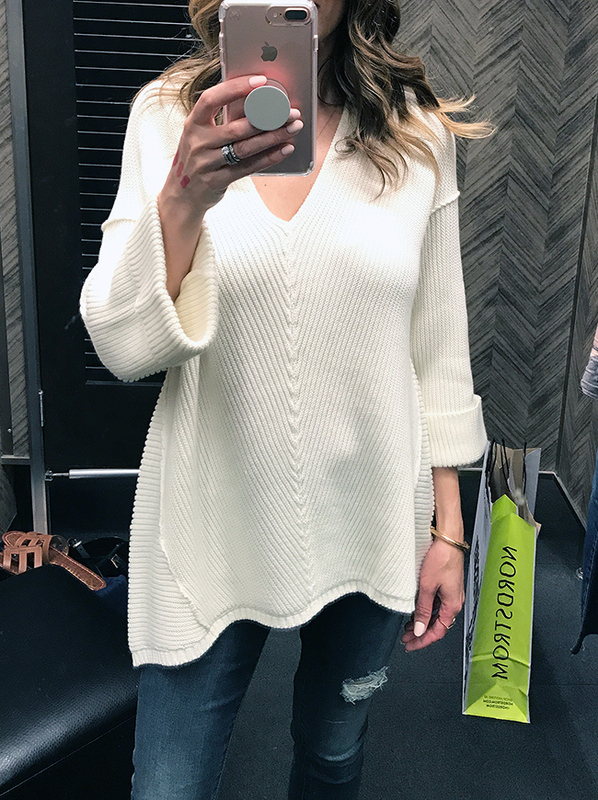 How fun is this bell sleeve sweater! I'm in love with the sleeves, as it makes the perfect statement piece. I'll be pairing it with denim shorts this summer, then it will look great with leather pants in the fall. The best part is that it makes a great alternative to the Lovers + Friends sweater that I've been eyeing. They're so similar, yet this one is only a fifth of the price! Size wise, it runs true to size. Because I like my sweaters to be a little boxy, I ended up getting the medium, although a small would have fit just fine. Also, these AG legging jeans are amazing! I have several pairs of the AG leggings, as they're one of my favorite jeans. This wash is perfect for the fall, and I love the undone hem. They run true to size and are $75 off the original price! 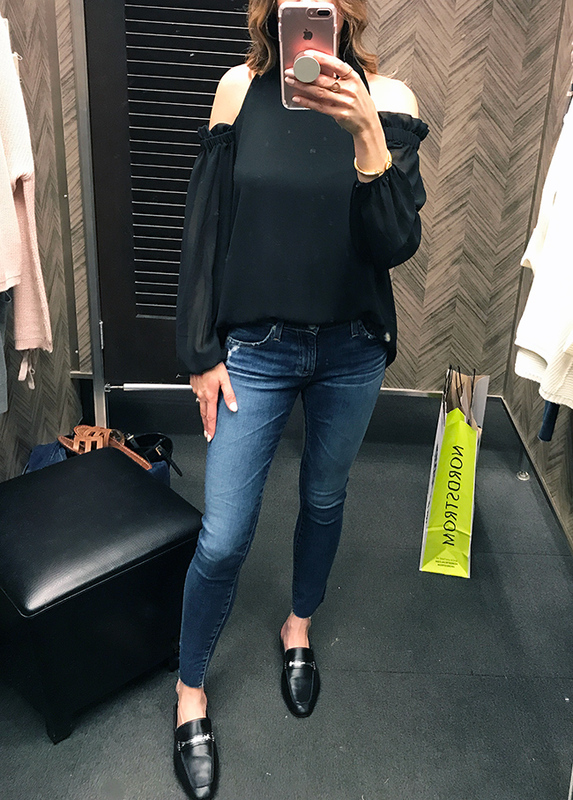 I'm a sucker for cold shoulders, so this Trouvé cold shoulder blouse caught my eye right away. I'm especially loving the ruffle detailing on the sleeves. It's available in black and burgundy, and runs slightly large. It's perfect for a date night or drinks with the girls. 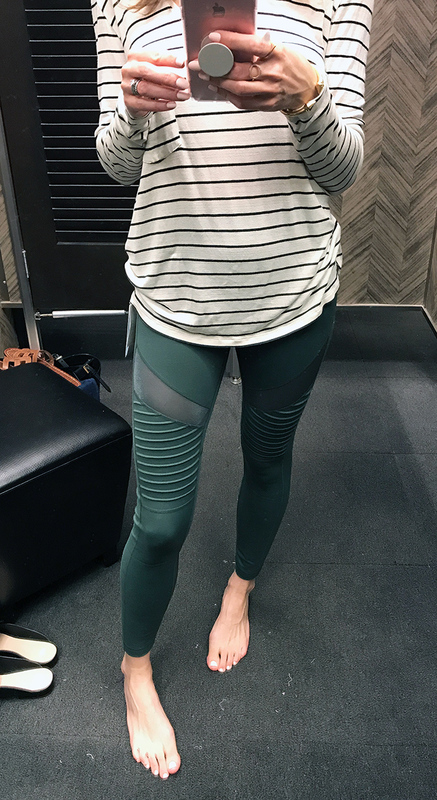 These leggings, guys, I'm obsessed!! I know they were a hot ticket last year, and I'm so happy that I snagged a pair on sale this time around. I love the higher rise, and the moto detailing makes them perfect for daytime wear, in addition to working out. Although I love the green, I ended up getting them in black because I know that I'll wear the black a lot more. 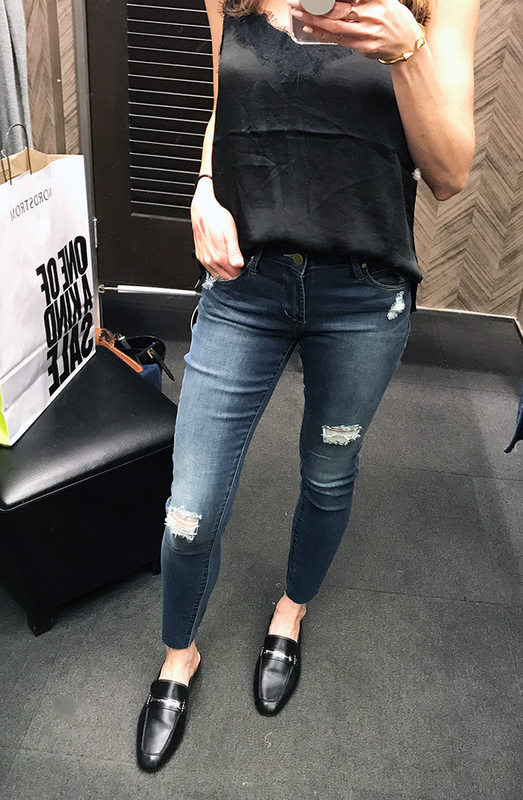 They run true to size (I'm wearing a small), and are on sale for $49.90 (originally $75). This stripe pocket tee is life! It's so soft, and I love the way it drapes. I know that it will be a staple in my wardrobe this fall whether wearing it on its own, or layered under a sweater or leather. It come in 6 colors and is on sale for $18.90. This cuff sleeve pullover sweater is the perfect item to throw on, and is under $50. I love the boxy fit, and dropped hem sleeves. It also come in burgundy and runs true to size. 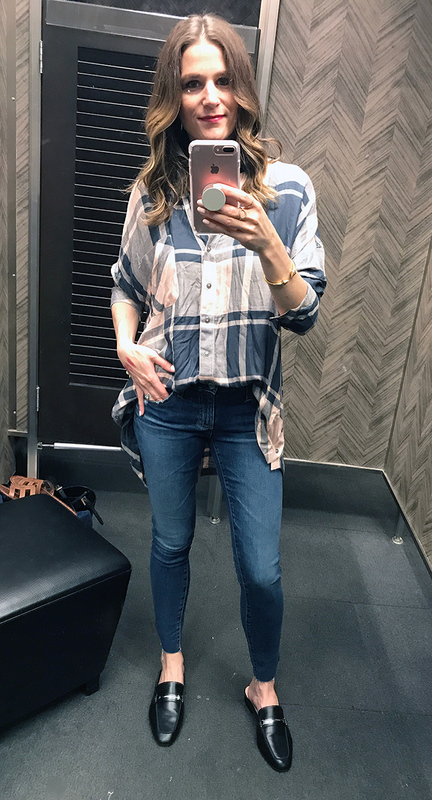 Everyone needs a plaid in their fall wardrobe, and this Topshop plaid tunic makes a great option (please ignore the fact that it needs major steaming). Not only am I in love with the colors, but the oversized fit, and longer hem, make it perfect for pairing with both jeans and leggings. It does run big, so make sure to size down. I also ordered these Vince Camuto booties online since they weren't available to my local Nordstrom, and can't wait to try them on. There are several items from my top picks that weren't available in my local store, so I may be doing another round of shopping soon! The feature blogger is Leelo of Beauty by Miss L. I'm loving her Boho blouse, and easy summer outfit. Make sure to visit her blog and say hello! You tried on so many great things in the sale! That striped tee is my favourite though - I love a good stripe! Sadly I'm still on my no buy (month 7 now!) so can't grab any bargains in the sale. I had my eye on most of these things so I love seeing them on a real person! That first outfit is so cute! Thank you for the linkup and have the best weekend! Really great picks, Rachael! I am loving the bell sleeve sweater. And those mules are fabulous! I never shop the store sale, because I'm always terrified they won't have what I want and then I'll go to buy it online and it will be gone!! :) But I bet it's fun! 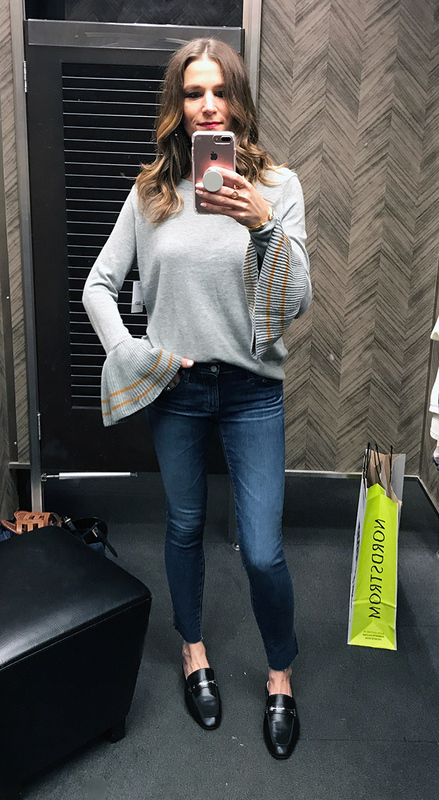 I love the bell sleeve sweater! You tried on great pieces! I especially love the cardigan and the bell sleeve sweater! I would certainly go for the Grey sweater! Fabulous! Love your dressing room diary! I wish we had a store here locally so badly! That bell sleeve sweater is too cute!! I picked up that leith cardi after a sales associate told me she still wears her's years later! The blush pink is really so pretty! Hope you get your hands on it! Loving the picks gal. NSale is here. I LOVE those leggings and I've been wanting a pair, too! Love that you got to shop in store. You are going to look great this fall, love everything you selected! Love your picks, especially that gray sweater with the sleeves! So many great picks! Perfect for fall weather! EVERYTHING looks so good on you Rach! Hot momma! I was debating getting that leith cardigan. It looks so good on you! Way better than it does online. Amazing finds!